The article “Growth Stage Cutoffs for Herbicide Applications in Corn and Soybean” by Purdue University Extension includes a summary of growth stage, height, and pre-harvest interval restrictions for a number of postemergence herbicides in corn and soybean. The article “Consider Application Restrictions of Postemergence Herbicides Based on Soybean Growth Stage” by University of Nebraska-Lincoln is another useful resource listing application restrictions in soybean. Note, not all of the products listed may be approved for a particular geography or soil type - be sure to check the herbicide label for specific details. If a product label lists both height and growth stage restrictions, use the more restrictive of the two. One notable difference between the Purdue article and restrictions for Minnesota, is the cutoff date for XtendiMax, Engenia, and FeXapan applications in dicamba-tolerant soybeans. In Minnesota, do not apply these products after June 20, 2018. Also, do not apply these products in Minnesota if the air temperature of the field at the time of application is over 85 degrees F or if the National Weather Service’s forecasted high for the nearest available location for the day exceeds 85 degrees F.
How do I determine corn growth stage and height? 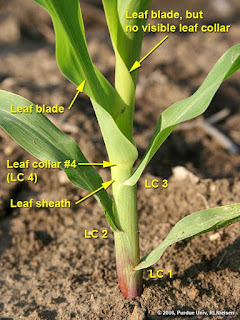 The corn leaf collar method is most commonly used to determine corn growth stage on herbicide labels, and by university and industry agronomists in the U.S. In this method, the number of number of leaves on a plant with a visible leaf collar are counted, beginning with the lowermost, short, rounded-tip true leaf and ending with the uppermost leaf with a visible leaf collar. The leaf collar is the light-colored collar-like “band” located at the base of an exposed leaf blade, near the spot where the leaf blade joins the leaf sheath which wraps around the stalk. Leaf stages are described as “V” stages: For example, V3 = three leaves with visible leaf collars (Figure 1). Leaves within the whorl that are not yet fully expanded and that have no visible leaf collar are not included in this staging method. An exception is that a leaf with a barely visible collar can be counted when staging plants early in the day, because the leaf collar may become completely visible by the end of the day. 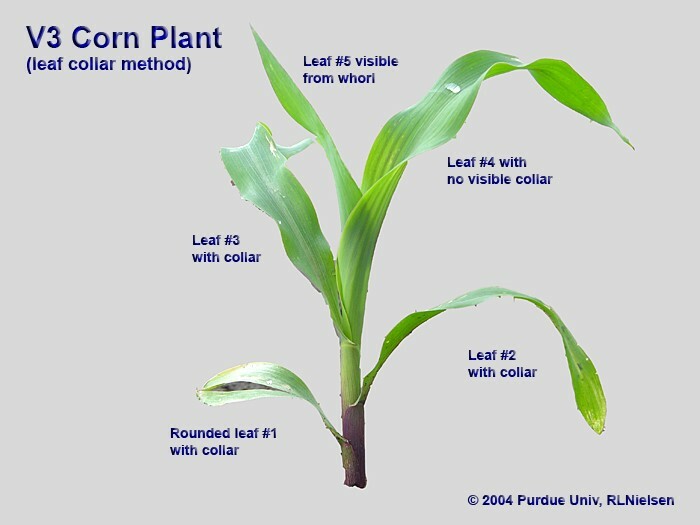 Figure 1: The leaf collar method is most commonly used to determine corn growth stage for herbicide application restrictions. The number of leaves with a visible, fully expanded leaf collar is preceded by a “V” in this method. Picture courtesy of Bob Nielson, Purdue University. Figure 2: Close up of V4 corn plant. Picture courtesy of Bob Nielson, Purdue University. 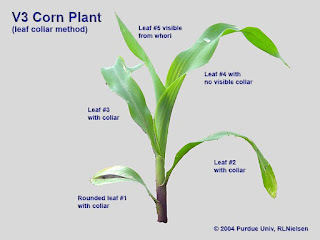 Further details on this method, including pictures, can be found in the article “Determining Corn Leaf Stages” by Bob Nielsen with Purdue University Extension. To determine corn height, measure from the soil surface to the arch of the uppermost leaf that is more than 50% emerged. How do I determine soybean growth stage? The article “Growth Stages” from University of Minnesota Extension describes soybean growth stages and lists the average number of days it takes to go from one stage to another. Another resource, the new "Visual Guide to Soybean Growth Stages" by Shawn Conley, State Soybean and Small Grains Specialist with the University of Wisconsin, is available online as a PDF to print or order to help agronomists and growers determine soybean growth stages. This guide describes the growth stages starting with germination, progressing through the vegetative stages (V) and concluding with the reproductive stages (R). Counting the number of nodes will determine the vegetative growth stage. To stage soybean, start at the top of the plant, find the uppermost open trifoliolate on the main stem and locate the corresponding node. Move down the stem to the next node. Count that node and all nodes below it on the main stem including the 1st leaf node where the unifoliolate leaves attached on the plant (unifoliolate node). Note a number of products need to be applied before flowering (R1) where there is an open flower at any node on the main stem, or before full bloom (R2) where there is an open flower at one of the two uppermost nodes on the main stem with a fully developed leaf.